"Vishnu Puran" redirects here. For the television series, see Vishnu Puran (TV series). The 'Vishnu Purana' (IAST: Viṣṇu Purāṇa) is one of the eighteen Mahapuranas, a genre of ancient and medieval texts of Hinduism. It is an important Pancharatra text in the Vaishnavism literature corpus. The manuscripts of Vishnu Purana have survived into the modern era in many versions. More than any other major Purana, the Vishnu Purana presents its contents in Pancalaksana format – Sarga (cosmogony), Pratisarga (cosmology), Vamśa (mythical genealogy of the gods, sages and kings), Manvañtara (cosmic cycles), and Vamśānucaritam (legends during the times of various kings). Some manuscripts of the text are notable for not including sections found in other major Puranas, such as those on Mahatmyas and tour guides on pilgrimage, but some versions include chapters on temples and travel guides to sacred pilgrimage sites. The text is also notable as the earliest Purana to have been translated and published in 1864 CE by HH Wilson, based on manuscripts then available, setting the presumptions and premises about what Puranas may have been. The Vishnu Purana is among the shorter Purana texts, with about 7,000 verses in extant versions. It primarily centers around the Hindu god Vishnu and his avatars such as Krishna, but it praises Brahma and Shiva and asserts that they are one with Vishnu. The Purana, states Wilson, is pantheistic and the ideas in it, like other Puranas, are premised on the Vedic beliefs and ideas. Vishnu Purana, like all major Puranas, attributes its author to be sage Veda Vyasa. The actual author(s) and date of its composition are unknown and contested. Estimates range of its composition range from 1st millennium BCE to early 2nd-millennium CE. The text was likely composed and rewritten in layers over a period of time, with roots possibly in ancient 1st-millennium BCE texts that have not survived into the modern era. The Padma Purana categorizes Vishnu Purana as a Sattva Purana (Purana which represents goodness and purity). Moriz Winternitz (1932): possibly early 1st millennium, but states Rocher, he added, "it is no more possible to assign a definite date to the Vishnu Purana than it is for any other Purana". Roy (1968): after the 9th century. Horace Hayman Wilson (1864): acknowledged that the tradition believes it to be 1st millennium BCE text and the text has roots in the Vedic literature, but after his analysis suggested that the extant manuscripts may be from the 11th century. Wendy Doniger (1988): c. 450 CE. As they exist today, the Puranas are a stratified literature. Each titled work consists of material that has grown by numerous accretions in successive historical eras. Thus no Purana has a single date of composition. (...) It is as if they were libraries to which new volumes have been continuously added, not necessarily at the end of the shelf, but randomly. Many of the extant manuscripts were written on palm leaf or copied during the British India colonial era, some in the 19th century. The scholarship on Vishnu Purana, and other Puranas, has suffered from cases of forgeries, states Ludo Rocher, where liberties in the transmission of Puranas were normal and those who copied older manuscripts replaced words or added new content to fit the theory that the colonial scholars were keen on publishing. The extant text comprises six aṃśas (parts) and 126 adhyāyas (chapters). The first part has 22 chapters, the second part consists 16 chapters, the third part comprises 18 chapters and the fourth part has 24 chapters. The fifth and the sixth parts are the longest and the shortest part of the text, comprising 38 and 8 chapters respectively. The textual tradition claims that the original Vishnu Purana had 23,000 verses, but the surviving manuscripts have just a third of these, about 7,000 verses. The text is composed in metric verses or sloka, wherein each verse has exactly 32 syllables, of which 16 syllables in the verse may be free style per ancient literary standards. The Vishnu Purana is an exception in that it presents its contents in Vishnu worship-related Pancalaksana format – Sarga (cosmogony), Pratisarga (cosmology), Vamśa (mythical genealogy of the gods, sages and kings), Manvañtara (cosmic cycles), and Vamśānucaritam (legends during the times of various kings). This is rare, state Dimmitt and van Buitenen, because just 2% of the known Puranic literature corpus is about these five Pancalaksana items, and about 98% is about diverse range of encyclopedic topics. Vishnu Purana opens as a conversation between sage Maitreya and his guru, Parashara, with the sage asking, "what is the nature of this universe and everything that is in it?" The first Amsha (part) of Vishnu Purana presents cosmology, dealing with the creation, maintenance and destruction of the universe. The mythology, states Rocher, is woven with the evolutionary theories of Samkhya school of Hindu philosophy. The Hindu god Vishnu is presented as the central element of this text's cosmology, unlike some other Puranas where Shiva or Brahma or goddess Shakti are. The reverence and the worship of Vishnu is described in 22 chapters of the first part as the means for liberation, along with the profuse use of the synonymous names of Vishnu such as Hari, Janardana, Madhava, Achyuta, Hrishikesha and others. The chapters 1.16 through 1.20 of the Vishnu Purana presents the legend of compassionate and Vishnu devotee Prahlada and his persecution by his demon king father Hiranyakasipu, wherein Prahlada is ultimately saved by Vishnu. This story is also found in other Puranas. Vishnu is described in the first book of Vishnu Purana as, translates Wilson, all elements, all matter in the world, the entire universe, all living beings, as well as Atman (soul) within every living being, nature, intellect, ego, mind, senses, ignorance, wisdom, the four Vedas, all that is and all that is not. The second part of the text describes its theory of earth, the seven continents and seven oceans. It describes mount Meru, mount Mandara and other major mountains, as well as Bharata-varsha (literally, the country of Bharata) along with its numerous rivers and diverse people. The seven continents are named Jambu, Plaksha, Salmala, Kusha, Krauncha, Saka and Pushkara, each surrounded by different types of liquids (salt water, fresh water, wine, sugarcane juice, clarified butter, liquid yoghurt, and milk). This part of the Vishnu Purana describes spheres above the earth, planets, the sun and the moon. Four chapters (2.13 to 2.16) of the second book of the text present the legends of King Bharata, who abdicates his throne to lead the life of a sannyasi, which is similar to the legends found in section 5.7 to 5.14 of the Bhagavata Purana. The geography of Mount Mandara as east of Mount Meru, presented in this book and other Puranas, states Stella Kramrisch, may be related to the word Mandir (Hindu temple) and the reason of its design, "image, aim and destination". The initial chapters of the third book of the Vishnu Purana presents its theory of manvantaras, or Manus-ages (each equals about 4.3 million years). This is premised upon the Hindu belief that everything is cyclic, and even Yuga (era, ages) start, mature and then dissolve. Six manvantaras, states the text, have already passed, and the current age belong to the seventh. In each age, asserts the text, the Vedas are arranged into four, it is challenged, and this has happened twenty eight times already. Each time, a Veda-Vyasa appears and he diligently organizes the eternal knowledge, with the aid of his students. The Vishnu Purana includes several chapters in book 3 on rites of passage from birth through death. Included are chapters on cremation rites (above). After presenting the emergence of Vedic schools, the text presents the ethical duties of the four varnas in chapter 2.8, the four Ashrama (stages) of the life of each human being in chapter 2.9, the rites of passage including wedding rituals in chapters 2.10 through 2.12, and Shraddha (rites in honor of ancestors, faith) in chapters 2.13 through 2.16. The Vishnu Purana asserts that the Brahmin should study shastras, worship gods and perform libations on behalf of others, the Kshatriya should maintain arms and protect the earth, the Vaishya should engage in commerce and farming, while the Shudra should subsist by profits of trade, service other varnas and through mechanical labor. The text asserts the ethical duties of all varnas is to do good to others, never abuse anyone, never engage in calumny or untruth, never covet another person's wife, never steal another's property, never bear ill-will towards anyone, never beat or slay any human being or living being. Be diligent in the service of the gods, sages and guru, asserts the Purana, seek the welfare of all creatures, one's own children and of one's own soul. Anyone, regardless of their varna or stage of life, who lives a life according to the above duties is the best worshipper of Vishnu, claims the Vishnu Purana. Similar statements on ethical duties of man are found in other parts of Vishnu Purana. The text describes in chapter 2.9, the four stages of life as brahmacharya (student), grihastha (householder), vanaprastha (retirement) and sannyasa (renunciation, mendicant). The text repeats the ethical duties in this chapter, translates Wilson. 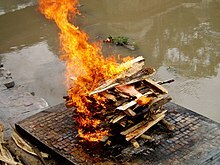 The chapters on Shraddha (rites for ancestors) describe the rites associated with a death in family, the preparation of the dead body, its cremation and the rituals after the cremation. The third book closes with the legend of Vishnu, through Mayamoha, helping the Devas win over Asuras, by teaching the Asuras heretical doctrines that deny the Vedas, who declare their contempt for the Vedas, which makes them easy to identify and thereby defeat. The longest part of the Vishnu Purana is dedicated to the legend of Krishna (above). The fourth book of the text, in 24 long chapters, presents mythical royal dynasties, starting with Brahma, followed by solar and lunar dynasties, then those on earth over the Yugas (eras), with Pariksit asserted as the "current king". The text includes the legends of numerous characters such as Shaubhri, Mandhatri, Narmada, sage Kapila, Rama, Nimi, Janaka, Buddha, Satyavati, Puru, Yadu, Krishna, Devaka, Pandu, Kuru, Bharata, Bhisma and others. The fifth book of the Vishnu Purana is the longest, with 38 chapters. It is dedicated to the legend of Krishna, as an avatar of Vishnu. The book begins with the story of Krishna's birth, his childhood pranks and plays, his exploits, his purpose of ending the tyranny of demon-tyrant king of Mathura, named Kamsa. The Krishna story in the Vishnu Purana is similar to his legend in the Bhagavata Purana, in several other Puranas and the Harivamsa of the Mahabharata. Scholars have long debated whether the Bhagavata Purana expanded the Krishna legend in the Vishnu Purana, or whether the latter abridged the version in former, or both depended on the Harivamsa estimated to have been composed sometime in the 1st millennium of the common era. pure, composed of happiness and wisdom. are those of Prakriti, not of soul. The last book of the Vishnu Purana is the shortest, with 8 chapters. The first part of the sixth book asserts that Kali Yuga is vicious, cruel and filled with evilness that create suffering, yet "Kali Yuga is excellent" because one can refuse to join the evil, devote oneself to Vishnu and thus achieve salvation. The last chapters, from 6.6 to 6.7 of the text discusses Yoga and meditation, as a means to Vishnu devotion. Contemplative devotion, asserts the text, is the union with the Brahman (supreme soul, ultimate reality), which is only achievable with virtues such as compassion, truth, honesty, disinterestedness, self-restraint and holy studies. The text mentions five Yamas, five Niyamas, Pranayama and Pratyahara. The pure and perfect soul is called Vishnu, states the text, and absorption in Vishnu is liberation. The final chapter 6.8 of the text asserts itself to be an "imperishable Vaishnava Purana". Vishnu Purana is one of the 18 major Puranas, and these text share many legends, likely influenced each other. The fifth chapter of the Vishnu Purana was likely influenced by the Mahabharata. Similarly, the verses on rites of passage and ashramas (stages) of life are likely drawn from the Dharmasutra literature. Rajendra Hazra, in 1940, assumed that Vishnu Purana is ancient and proposed that texts such as Apasthamba Dharmasutra borrowed text from it. Modern scholars such as Allan Dahlaquist disagree, however, and state that the borrowing may have been in the other direction, from Dharmasutras into the Purana. Other chapters, particularly those in book 5 and 6 of the Vishnu Purana have Advaita Vedanta and Yoga influences. The theistic Vedanta scholar Ramanuja, according to Sucharita Adluri, incorporated ideas from the Vishnu Purana to identify the Brahman concept in the Upanishads with Vishnu, thus providing a Vedic foundation to the Srivaishnava tradition. ^ This is not the version that has survived into the modern era. The estimates for earliest version are based on the analysis of the content, events described, literary style, references to other Indian texts within this Purana. ^ a b c Dalal 2014, p. 460. ^ Rocher 1986, pp. 245-249. ^ Rocher 1986, pp. 18, 245-249. ^ Wilson 1864, pp. xxxiv-xxxv. ^ a b Gregory Bailey (2003). Arvind Sharma, ed. The Study of Hinduism. University of South Carolina Press. pp. 141–142. ISBN 978-1-57003-449-7. ^ a b Rocher 1986, pp. 248-249. ^ a b Rao 1993, pp. 85–100. ^ a b Johnson 2009, p. 248. ^ a b c d e f g h i j k l Rocher 1986, p. 249. ^ Ariel Glucklich 2008, p. 146, Quote: The earliest promotional works aimed at tourists from that era were called mahatmyas. ^ Wilson 1864, pp. i-xviii, for full context and comparison of Vishnu Purana with other Puranas then known, see all of the Preface section..
^ Gregory Bailey (2003). Arvind Sharma, ed. The Study of Hinduism. University of South Carolina Press. pp. 148–149. ISBN 978-1-57003-449-7. ^ a b Wilson 1864, p. xxxv. ^ a b Rocher 1986, p. 246, 248 with footnote 501. ^ Wilson 1864, pp. xii-xiv. ^ Rocher 1986, p. 48. ^ Rocher 1986, pp. 41-48, 249. ^ Wilson, H. H. (1840). The Vishnu Purana: A system of Hindu mythology and tradition. Oriental Translation Fund. p. 12. ^ Dimmitt & van Buitenen 2012, p. 1-7. ^ Rocher 1986, p. 38-49, 59-66. ^ K P Gietz 1992, p. 986 with note 5739. ^ Edward Balfour (1885). The Cyclopædia of India and of Eastern and Southern Asia. B. Quaritch. p. 1025. ^ Collins 1988, p. 36. ^ a b Dimmitt & van Buitenen 2012, p. 5. ^ a b Rocher 1986, pp. 49-53. ^ a b Rocher 1986, p. 246. ^ Rocher 1986, pp. 246-248. ^ Kireet Joshi (1991). The Veda and Indian Culture: An Introductory Essay. Motilal Banarsidass. p. 106. ISBN 978-81-208-0889-8. ^ Dimmitt & van Buitenen 2012, p. xiii. ^ Dimmitt & van Buitenen 2012, p. 9. ^ a b c d e f g h i j Rocher 1986, p. 247. ^ Wilson 1865, pp. 94-95. ^ a b c Rocher 1986, pp. 246-247. ^ a b Wilson 1865, pp. 93-96. ^ Dutt 1896, pp. ii-iii. ^ Wilson 1865, pp. 32-68. ^ Wilson 1864, pp. 170-172, 196-198. ^ a b Wilson 1865, pp. 109-126. ^ Wilson 1865, pp. 127-190. ^ Wilson 1865, pp. 312-336. ^ Kramrisch 1976, p. 161 with footnote 78. ^ a b Wilson 1866, pp. 1-19. ^ Wilson 1866, pp. 33-51. ^ Wilson 1866, pp. 40-42. ^ Wilson 1866, pp. 80-199. ^ Wilson 1866, pp. 85-87. ^ a b Dutt 1896, pp. 191-192. ^ a b c Wilson 1866, pp. 80-90. ^ a b Dutt 1896, pp. 191-193. ^ NK Devaraja (1976), What is living and what is dead in traditional Indian philosophy?, Philosophy East and West, Volume 26, Issue 4, pages 427-442, Quote: "Thus in the Visnu Purana, Prahlada, the great devotee of Visnu, is found making a number of statements of the following type: Knowing that god Visnu is present in all creatures - since neither the totality of living beings, nor myself, nor the food is other than Viṣṇu - I serve all creatures with food; may this food bring them satisfaction. Elsewhere, in the same text, we read: We offer obeisance to that unborn, imperishable Brahman which is present in our and others bodies and in everything else, there being nothing other than it anywhere. This teaching of the ethics of universal love and service..."
^ a b Wilson 1866, pp. 92-96. ^ a b Dutt 1896, pp. 194-196. ^ Wilson 1866, pp. 1 48-170. ^ Wilson 1866, pp. 207-227. ^ Wilson 1866, pp. 229-336. ^ Wilson 1868, pp. 1-242. ^ Dutt 1896, pp. 237-306. ^ a b c d e f g Rocher 1986, p. 248. ^ Wilson 1868, pp. 245-342. ^ a b Wilson 1870, pp. 1-167. ^ Dutt 1896, pp. 317-418. ^ Wilson 1870, pp. 245-342. ^ Bryant 2007, pp. 9-10, 95-109 (Chapter by Ekkehard Lorenz). ^ Wilson 1870, p. 225. ^ Wilson 1870, pp. 168-255. ^ Wilson 1870, pp. 177-185 with footnotes. ^ Wilson 1870, pp. 216-255. ^ Wilson 1870, pp. 227-229 with footnotes. ^ Wilson 1870, pp. 230-232 with footnotes. ^ Wilson 1870, pp. 242-243. ^ Wilson 1870, p. 244. ^ a b Allan Dahlaquist (1996). Megasthenes and Indian Religion. Motilal Banarsidass. p. 92 with footnote 1. ISBN 978-81-208-1323-6. ^ R. Balasubramanian (2000). "Advaita in the Puranas". Advaita Vedānta. Motilal Banarsidass. pp. 51–78. ISBN 978-8187586043. Bryant, Edwin Francis (2007). Krishna: A Sourcebook. Oxford University Press. ISBN 978-0-19-803400-1. Collins, Charles Dillard (1988). The Iconography and Ritual of Siva at Elephanta: On Life, Illumination, and Being. SUNY Press. ISBN 978-0-88706-773-0. Dalal, Rosen (2014). Hinduism: An Alphabetical Guide. Penguin. ISBN 978-8184752779. Dutt, MN (1896). A prose translation of Vishnupuranam. Elysium Press. Flood, Gavin (1996). An Introduction to Hinduism. Cambridge: Cambridge University Press. ISBN 0-521-43878-0. K P Gietz; et al. (1992). Epic and Puranic Bibliography (Up to 1985) Annoted and with Indexes: Part I: A - R, Part II: S - Z, Indexes. Otto Harrassowitz Verlag. ISBN 978-3-447-03028-1. Ariel Glucklich (2008). The Strides of Vishnu : Hindu Culture in Historical Perspective: Hindu Culture in Historical Perspective. Oxford University Press. ISBN 978-0-19-971825-2. Johnson, W.J. (2009). A Dictionary of Hinduism. Oxford University Press. ISBN 978-0-19-861025-0. Kramrisch, Stella (1976). The Hindu Temple, Volume 1 & 2. Motilal Banarsidass. ISBN 81-208-0223-3. Rao, Velcheru Narayana (1993). "Purana as Brahminic Ideology". In Doniger Wendy. Purana Perennis: Reciprocity and Transformation in Hindu and Jaina Texts. Albany: State University of New York Press. ISBN 0-7914-1381-0. Wilson, H. H. (1864). The Vishnu Purana: A System of Hindu Mythology and Tradition (Volume 1: Introduction, Book I). Read Country Books (reprinted in 2006). ISBN 1-84664-664-2. Wilson, H. H. (1865). The Vishnu Purana: A System of Hindu Mythology and Tradition (Volume 2: Book I & II). Wilson, H. H. (1866). The Vishnu Purana: A System of Hindu Mythology and Tradition (Volume 3: Book III & IV). Wilson, H. H. (1868). The Vishnu Purana: A System of Hindu Mythology and Tradition (Volume 4: Book IV & V). Wilson, H. H. (1870). The Vishnu Purana: A System of Hindu Mythology and Tradition (Volume 5 Part 1: Book V & VI). Mani, Vettam. Puranic Encyclopedia. 1st English ed. New Delhi: Motilal Banarsidass, 1975.